Feeling wobbly, forgetful, and introverted during this Mercury retrograde cycle? This can be a great time for renewal and self-reflection. The Mercury Retrograde Body Mitten (TM) is designed specifically to contain and counteract the powerful negative mental and energetic effects of Mercury retrograde. Each body mitten is hand-knitted by celibate Virgos using hypo-allergenic squirrel wool inter-woven with strands of unicorn hair that were marinated in lavender oil infused with emerald powder. This energetic matrix provides a comfortable and fashionable garment to create an aware and stable personal environment before, during, and after Mercury retrograde. Production of our body mittens follows a strict process of spiritual guidance, prayer, and attunement to the planet. After knitting, garments are dyed a limited range of peaceful colors (aquamarine, blue, green, mauve, teal) in a solution of Clematis, Narcissus, and White Chestnut flower essences to help ground thoughts and calm an over-stimulated mind. The communication port located equidistant between the crown and throat chakras helps to release ideas and thoughts through communication, while the grounding port located below the base chakra allows optional access to reality, and discreet bodily functions, as required. Mercury Retrograde Body Mittens come in several sizes. If you have a moderate-sized neurosis, just slip into our Mer-X size model, and you’ll immediately feel comforted by the warm sense of enclosure and protection the body mitten provides. For New Age devotees crippled by more complex anxieties, say, involving both Mercurophobia and claustrophobia, you might want to consider our Mer-XL model which gives you greater freedom to thrash around inside your own little insular world. And for co-dependent reality-denial couples, nothing says “I honor the neurotic me I see reflected in you” better than our Mer-2XL model, which features an inner partition liner (not shown) for couples who want to enjoy togetherness without actual physical contact. Note: the Mercury Retrograde Body Mitten is not suitable for children, animals or the elderly with mobility problems. It is, however, eminently suitable for breastfeeding mothers in arch-conservative environments. 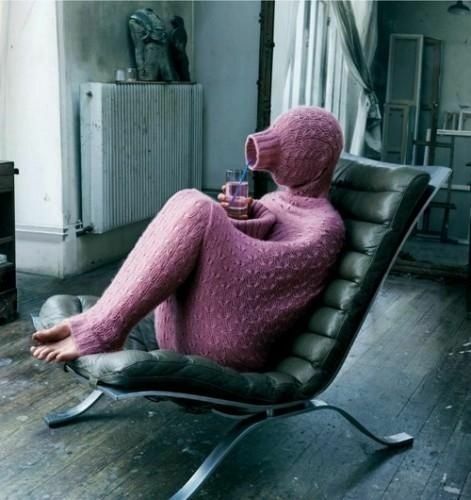 The Mercury Retrograde Body Mitten: when the world gets too scary for three weeks at a time, you’re safe in your own little world.